Olive oil ice cream is our assigned recipe this week for French Fridays with Dorie, an online cooking group that I participate in but haven’t been keeping up with lately. I’ve been wanting to make olive oil ice cream and like most all of the recipes from Around My French Table by Dorie Greenspan, I figured this ice cream recipe to be another keeper. I just couldn’t resist giving my olive oil ice cream a little tweak in the form of a few added pinches of Spanish saffron from a good friend who brought some home for me from Spain. Oh, and I’m glad I did the tweaking because the aroma, flavor and mellow yellow color from the saffron made my ice cream into a scoop to be reckoned with on the top of a slice of apricot pie. You don’t have to get all fancy with your pie making skills, just try my easy rustic apricot pie recipe that I’m sharing below. Feel free to buy the pastry dough to make this a really simple dessert to put together in a pinch because who wants to spend too much time in the kitchen when the weather this time of year is so pleasant outside. Have the dough chilled, ready to roll or defrosted if purchased and ready to place in 9″ pie plate. Gently toss the apricot slices in a large bowl with the sugar, flour, and baking spice. Roll the homemade dough into a circle slightly larger than a 9″ pie plate. Place the rolled out dough inside a 9″ pie plate and let it drape over the outside. Mound up the apricot mixture inside the pie plate and fold the dough back over the sides of the fruit. Place the butter bits over the top and brush the dough edge with the heavy cream. Place on a baking sheet, in case the juices boil over. Bake for 10 minutes and reduce the oven to 375 degrees F for about 45 additional minutes. Cool on a metal rack before serving. Prepare a ice water bath using a large bowl with a strainer set on top of a heatproof bowl placed in the ice water ready for the hot custard. Using a heavy weight medium saucepan bring the milk and cream to a boil. Next to the stove in a large bowl beat the egg yolks with the sugar for a few minutes, until the mixture is slightly thicker. Continue to whisk the egg mixture while slowly pouring in about a ladleful of the hot milk mixture to temper the eggs. Slowly pour the remaining hot milk mixture into the egg mixture, whisking the whole time. Pour the custard mixture into the saucepan, adding the salt and saffron. Cook the custard over a medium heat, switching to a spatula to stir. Cook and stir until the custard coats the back of a spoon. You should be able to trace a line that the custard doesn’t run through. The custard should be more than 170 degrees F but not more than 180 degrees F. Remove the custard from the heat and pour through the strainer into the heatproof bowl in the water bath. Stir in the olive oil and the vanilla. Stir the custard occasionally as it cools down. When the custard is cool place in the refrigerator to continue chilling for several hours or overnight. Pour the chilled custard into the bowl of an ice cream maker and churn following the manufacturer’s instructions. Scrape the ice cream into an airtight container and place in the freezer for at least 2 hours or until it’s firm enough to scoop. Patty, both ice cream and apricot pies are amazing! I have never had/made ice cream with olive oil and saffron…it's fascinating and beautiful. Now I know for sure that I'm the only food blogger without an ice cream maker! argh! maybe next year, I'll get one! Because if the result is this good lookin' of an ice cream, then I should really get one! This sounds so exotic and Mediterranean and sunny and happy! Would love to try this NOW! I've been lovin' all the ice cream flavors posting lately, but this takes the cake – or pie I would love to try this Patty! I'm so intrigued by this dessert, Patty! I've never tried olive oil ice cream and I love the addition of saffron here! Wow. Can I just say, “wow?” For once I am speechless. I do believe the saffron addition is brilliant, and on the apricot pie, it is definitely a perfect pairing of flavors. AMAZING!!! I was surprised to see olive oil in the ice cream title, but not only that, your apricot pie is one of the delicious looking pie I've ever seen. I love pie and I usually like classic apple pie, but this one looks SO good. I never thought I would say something like that for apricot pie… You totally changed my mind. I want this pie, AND this super unique saffron olive oil ice cream. This is the best match pie and ice cream ever Patty!! This looks incredible. The color of your olive oil ice cream with saffron added blends beautifully with the apricot pie. It looks like a marriage made in heaven. 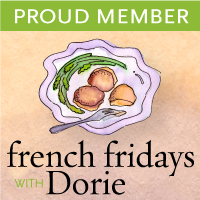 I love Dorie's recipes and like you am a member but always forget until I see everyone posting on Fridays. This ice cream sounds delightful. I've been wanting to make an olive ol ice cream and cake. Now I have no excuse. Thank you for sharing these recipes and lovely photos! WOW times two! Nice going for you! Wow! Both the ice cream and the pie look fabulous! I think rustic pies are the best. Thank you for sharing! My mouth IMMEDIATELY began watering as soon as I saw that photo. I'm completely intrigued. Maybe it's time to fire up the ice cream maker! And I'm thinking the nectarines I have hanging out on my counter would be great in this pie. Yum! I too don't have an icecream maker but I love making rustic pies of all sorts. There's something comforting about them. A good dollop of whipped cream does the job well enough. Looks like a wonderful dessert to me — one I'd certainly order if I saw it on a menu. Patty – I adore anything with olive oil in it and your olive oil ice cream looks and sounds supreme! I wish I was having dessert at your house tonight. Delish!!!!! The texture of that ice cream looks amazing, and I LOVE the rustic crust on that pie! Your pie looks absolutely wonderful! I had olive oil ice cream for the first time last weekend. Thanks for your recipe. Patty – this is lovely! Such a gorgeous looking pie…perfect for serving with the Olive Oil Ice Cream! Beautiful photos…great post! Have a great weekend! Patty-a vision of “beauty” is your apricot pie, with the gorgeous crust, and your ice cream with the saffron, and olive oil. A perfect combination with the pie! Just absolutely magnificent. Your photos are always perfect, and flawless! Beautiful color on your ice cream – isn't saffron a wonderful thing??? So pretty with the pie!! OK- I want it all The pie, the ice cream, the gorgeous napkins…you name it. Can I come over for a slice with Nana ?? Just kidding. And thanks for including that apricot recipe because now we can indulge from here. Awesome job and those photos captured it ! Your pictures are so beautiful Patty! What a fun post! Both your ice cream and pie look wonderful, Patty. There must have been some saffron in my Spanish olive oil because both of our ice creams have similar color. Loved this one for sure and I bought some really good apricots last week and will have to go get some more today because I want to try your apricot pie recipe. I also enjoy making the rustic versions of pies – less fussy! OMG that looks delicious! Very clever pairing. That looks great! I have never made an apricot pie. I may have to start now! I agree that the ice cream was delicious. Oh my, how increbible…the ice and the pie look so fabulous! The next time you make the ice cream and tart together can I come over? I've been on an apricot kick lately and who wouldn't love the sound of the saffron olive oil ice cream? They look stupendous together! Another beautiful creation, Patty. Oh my! That combination makes me wish I did have an ice cream maker. Love the apricot tart and strands of saffron in the ice cream seem like just the perfect touch. I finally made the olive oil ice cream last week and I really enjoyed it – oh, how I wish I’d visited this post first, though. The tart and the saffron in the ice cream sound heavenly! The ice cream sounds really interesting and good. But apricots are one of my favorite fruits. I'm so glad you shared the pie recipe. Looks fantastic! I love olive oil ice cream. You made it more special with saffron. Wow! And the apricot pie is just pure heaven. I really can't wait for my apricots to ripen! Well, Patty, I'm sure happy you shared this FFWD week and recipes with us. I am a huge saffron fan – my family has made saffron biscuits and bread for generations. Never thought of adding it to ice cream. It adds a lovely yellow tinge to the ice cream. Apricots are just coming into season here so I will definitely try this pie recipe. Thank you. Thank you. Saffron! Score! Indeed! Must have been sublime! If it hadn’t been for FF with Dorie I think it had taken me a while to find out there is such thing as olive oil ice-cream. And the saffron addition, so brilliant. Love its color and aroma. The apricot pie looks amazing as well! Olive oil ice cream, with a dash of saffron ~ winner and the apricot pie is amazing! Just stopping by to say thanks for being a part of the YBR:) Have a great holiday.